A non-life-threatening neurological disorder in which the muscles of the larynx involuntarily spasm and interfere with the voice. Spasmodic dysphonia is a focal dystonia, in this case involving the larynx—i.e., laryngeal dystonia. Laryngeal dystonia typically affects the voice, but can occasionally also affect breathing (respiratory dystonia). The term spasmodic dysphonia refers specifically to voice-affecting laryngeal dystonia. There are two main variants of spasmodic dysphonia (SD). In the first variant, adductor SD (AD-SD), the vocal cords are pressed together excessively, intermittently cutting off words or giving the voice a constant strangled quality; this variant comprises 90% of the cases of SD. In the second variant, abductor SD (AB-SD), the vocal cords are abruptly and momentarily pulled apart while talking, causing the voice to drop out completely or down to a whispery, breathy sound. There are some cases in which a person has both of these variants: this is called mixed AB-AD SD. Another distinction that can be made is between classic variant and tonic variant cases of SD. In classic variant SD, the spasms cause phonatory arrests—that is, while the person is speaking, intermittent words or syllables are choked off (with AD-SD) or drop out (with AB-SD). In tonic variant SD, the spasms are more continuously sustained, so that the voice continuously sounds either strained (with AD-SD) or breathy (with AB-SD), but without any actual phonatory arrests. Because the presence of phonatory arrests is the symptom most often associated with SD, tonic variant SD goes undiagnosed or misdiagnosed far more frequently than does classic variant SD. The leading surgical treatment currently offered for SD, Selective Laryngeal Adductor Denervation-Reinnervation, can be an option for individuals with the AD-SD variant. However, no treatment for SD works satisfactorily for all. The history of each of the several surgical treatments for SD always includes some failures. Speech therapy is another treatment sometimes suggested for SD. While there are strong and even passionate individual proponents of speech therapy, the consensus view is that speech therapy is not expected to substantially improve the voice’s capabilities or reduce spasms other than perhaps in the therapy room1. A brief course of speech therapy can be very helpful for patient education and perhaps a search for sensory tricks. Much confusion surrounds this subject, because individuals who have a nonorganic voice disorder can be mistakenly diagnosed with SD, and nonorganic voice disorders are routinely “cured” with speech therapy alone. Prephonatory instant, with arytenoid cartilages involuntarily positioned apart. Mostly tonic position giving voice relatively constant breathiness. Phonatory blur, standard light. Again note the separation of the arytenoid cartilages posteriorly (upper end of the photo), and broad vibratory blur, both consistent with breathy voice. Occasionally, patient is able to bring posterior cords together for an instant of normal-sounding voice. An instant later, the vocal cords involuntarily separate due to an abductory spasm, dropping the voice again to a whispery quality. Vocal cords in normal breathing position, in a person with abductor spasmodic dysphonia (SD). The next three photos show how the vocal cord spasms seen with SD can get worse when the person performs more cognitively loaded or involved tasks (that is, the person has to think more). This pattern is related to the widespread understanding that SD's symptoms can be task-specific. When making voice with guttural vocal fry or sustained creaky falsetto, this person is able to keep the vocal cords together, at least part of the time. When the person tries to sustain a sung tone (slightly more cognitively loaded), the vocal cords involuntarily separate, producing a very breathy voice. When the person speaks (even more cognitively loaded), the vocal cords separate even further, and the voice's breathiness is pronounced. This person had a major voice change after thyroidectomy for a large goiter. Within 2 months, voice recovered fully--except for a sense of instability. The PCA-only paresis is not the explanation because voice-making muscles (TA + LCA) are intact. And in fact vocal capability testing shows that both yell and projected voice are normal. The visual finding here of vocal cord bowing and capacious ventricle do not count as a breathing position finding with PCA-only paresis due to the unopposed action of LCA muscle, combined with an uncontracted TA muscle, both of which cause pseudo-bowing. During phonation under strobe light, with TA tensing, "bowing" disappears. Furthermore the vibratory "blur" at the margin of the left fold (right of photo) is equal to the right (left of photo), telling us that vibratory amplitude is approximately the same on both sides. An audible/ visible spasm occurs when the right vocal cord jerks laterally for 4 frames (~ 1/8th of a second). The problem isn't PCA weakness on the left (right of photo), but instead an abductory spasm on the right (left of photo), fully mobile cord! This young soprano has had to put singing to the side due to a peculiar instability at a very specific part of her singing range: approximately G4 to B4. Speaking voice is completely normal. Above and below G4 to B4 the voice works well. Here, during somewhat distant view during breathing, no mucosal abnormality is seen. During phonation at high pitch designed to reveal margin swelling, there is a slight gap of “physiologic bowing” but arytenoids seem to approximate well. Closed phase of vibration at G4 (392 Hz). Nothing significant is seen in this admittedly somewhat distant view. Ten frames, a fraction of a second-later, a sudden spasm is seen (arrows) and heard. This adductory spasm happens consistently and repeatedly with numerous elicitations, but only in the narrow pitch range already noted in caption 1. The vocal cords of a physical education teacher with mild, intermittent ‘hoarseness’ and cracking of voice. Given her occupation, the mind goes to “voice abuse” and the margin swelling seen here might play into the diagnosis of “vocal overdoer with mucosal injury.” However, the vocal capability battery (voice testing) protects from a misdiagnosis. During the vocal capability testing (part 2 of the Integrative Diagnostic Model), one hears no significant mucosal swelling phenomenology (during application of vocal cord swelling checks), but instead a quivery, jittery instability. The actual diagnosis? Spasmodic dysphonia. Dr. Robert Bastian reviews the various types and subtypes of spasmodic dysphonia (SD). 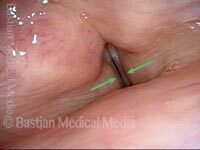 Numerous voice examples are included, along with video of the vocal folds. SD is a rare neurological disorder caused by laryngeal dystonia, and it interferes with the smooth functioning of the voice. Tiny spasms of the vocal folds may cause the voice to catch or cut out, strain or squeeze away, and sometimes to drop momentarily to a whisper. In this video, Dr. Bastian discusses common problems with Botox treatment for spasmodic dysphonia (SD) and offers clear, practical advice to increase the effectiveness of these treatments. In this video, Dr. Bastian leads a panel discussion on Spasmodic Dysphonia. This entry was posted in Multimedia Encyclopedia and tagged Disorders, Neurological voice disorders, Photos, Videos, Voice & other larynx disorders by admin. Bookmark the permalink.